It’s hard to believe that the holiday season is over and that another year is already in tow. This year, the holidays seemed to go by especially fast. The combination of running back and forth to the different parties and gatherings, in conjunction with having an extremely active one year old makes for one VERY busy holiday season. 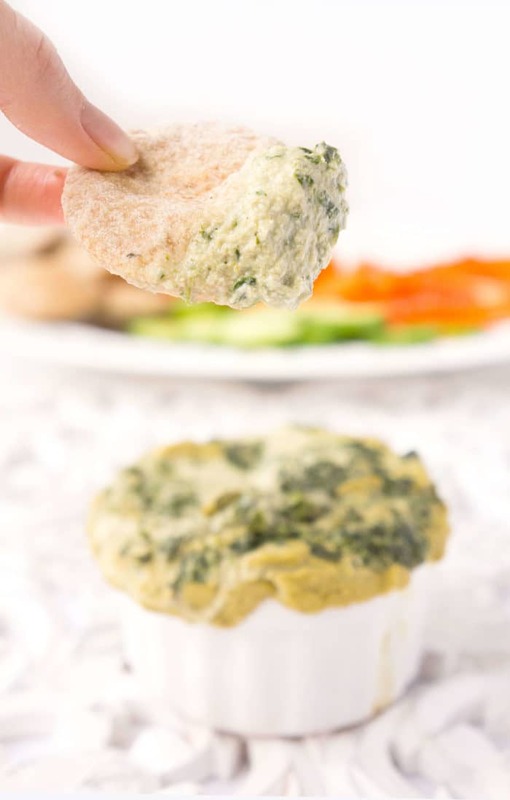 Since we had a new house this year and did a little more entertaining than usual, one of the recipes that I wanted to try out was this Vegan Spinach Artichoke Dip. I’ve always wanted to try making a spinach artichoke dip but never seemed to find the right occasion to make it. This year, however, I decided to make it happen. And I’m SO glad that I did! I honestly wasn’t quite sure how the combination of flavours would taste together, but it turns out that they complimented each other very nicely, making for one very flavourful dip! There’s a few things to keep in mind to make this dip extra tasty. First of all, I just want to say that this recipe is REALLY easy. You just have to follow the steps! I recommend soaking the cashews in advance to make sure that the consistency of the dip has a smooth base without any crunchy cashews floating around. It’s not the worst thing in the world if this happens, but it’s much better to have a crunch-free base. I like to boil some water in the kettle and place the cashews and water in a bowl to soak overnight before I make the rest of the recipe. Next, you’ll want to fry up the onions, garlic and spinach in some olive oil to bring out those mouthwatering flavours and soften them up before blending all of the ingredients together. In order to make this dip, you’re going to require a pretty powerful blender. I used my Ninja blender for this dip and it definitely got the job done. Simply toss the first five ingredients into the blender and blitz it until it’s smooth and creamy. This happened in a matter of seconds when I tossed it all in the Ninja. I’m LOVING that thing! Once you’ve blended the first five ingredients, next you’re going to add the “chunkier” ingredients. And chunky is key. 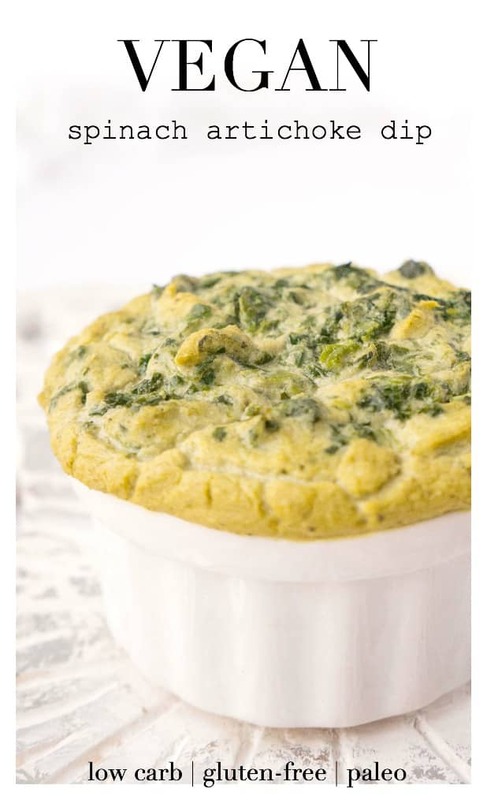 You literally want to tap on the button of your blender (especially if it’s extra powerful) and pulse it just a few times so that the onions, garlic, spinach and artichokes get slightly broken up, but still remain chunky. 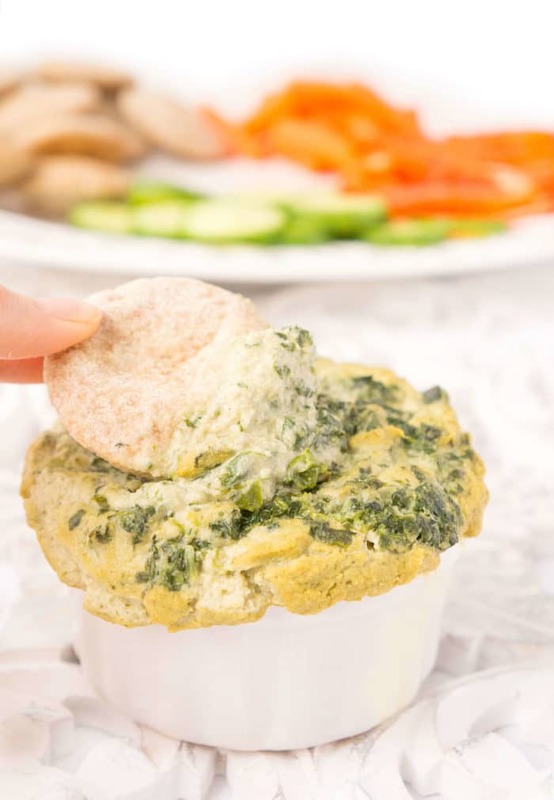 You can, of course, blend it until smooth, but it will have more of a hummus consistency rather than a chunky spinach artichoke dip consistency. Next, it’s time to bake! You can eat it as is, but placing it in the oven brings it to a whole new level! It forms a nice browned layer on the top and makes it all warm and creamy on the inside. SO GOOD. When it comes to baking it in the oven, you can use whichever baking dish that you prefer. I didn’t really have the right size baking dish to fit all of the dip (it makes quite a bit! 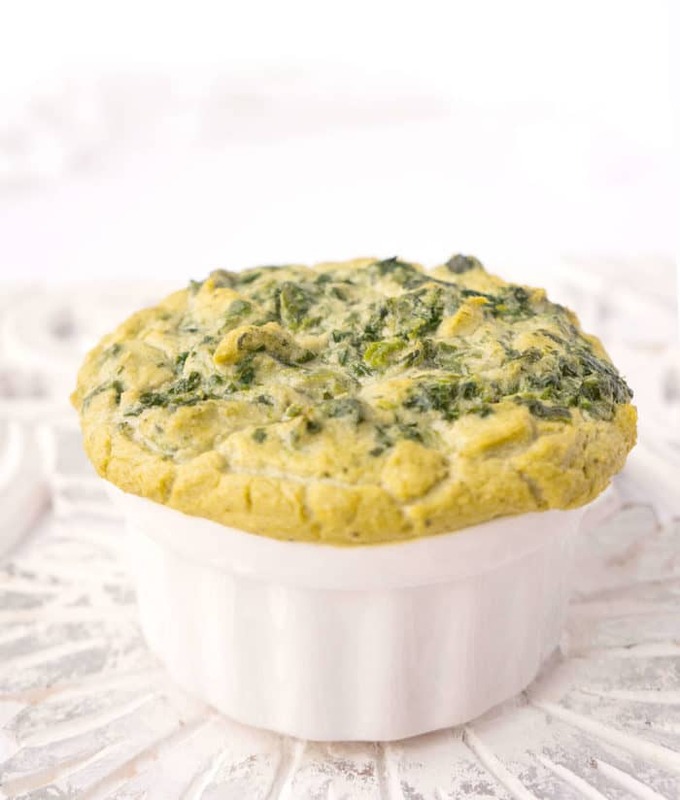 ), so I just transferred the vegan spinach artichoke dip mixture into three medium-sized ramekins and it did the trick! The good thing about the ramekins is that you can save the separate dips for different occasions without the worry of contamination with people double dipping. We all know it happens! I happened to make a double batch of this dip and it lasted FOREVER. To the point where I was putting it on everything just to use it up. I served it with veggies and homemade pita chips, put it on salmon, spread it on a wrap, and mixed it in with tuna. It’s definitely a multi-purpose dip/spread. And you’d never guess it was vegan. It tastes all warm and cheesy even though it’s completely dairy-free. The secret to this cheesy flavour is the use of nutritional yeast. 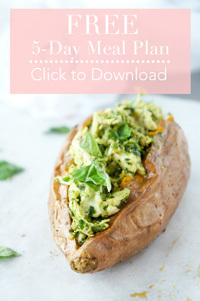 Another benefit of this ingredient is that it’s loaded with vitamin B12, which is a struggle to obtain enough of if avoiding animal products, so the nutritional yeast is an amazing option for increasing your intake. 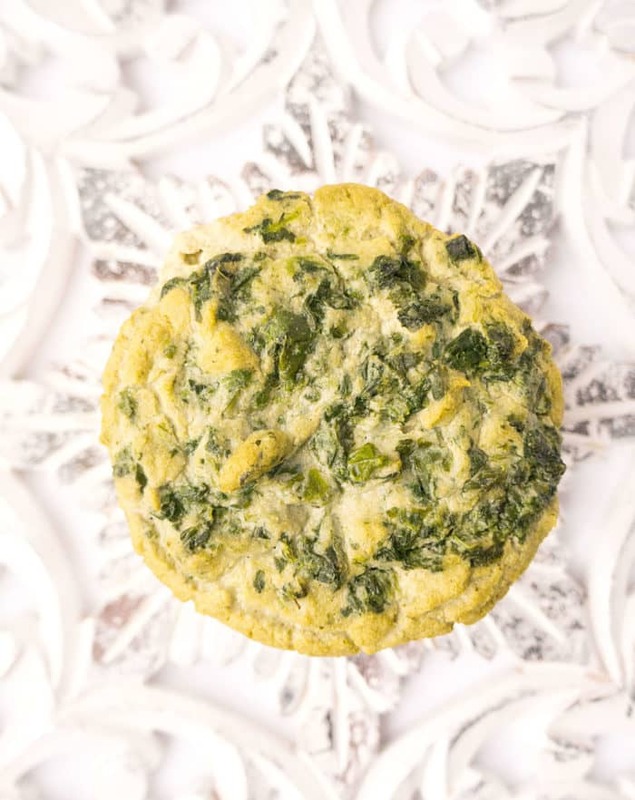 The artichokes and spinach incorporate some extra veggies, fibre, folate, vitamin C and potassium, while the cashews provide those healthy fats. 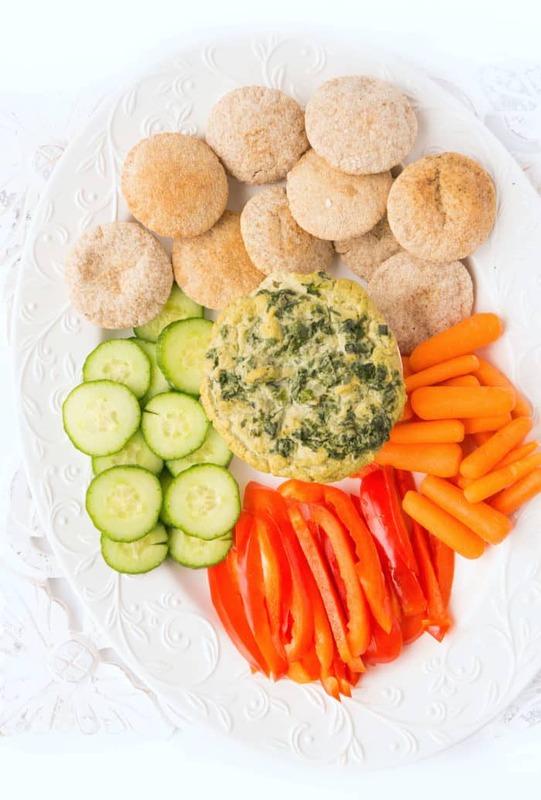 Serve it along with some fresh veggies, whole-grain pita chips or crackers for a healthy and filling appetizer or snack! Soak the cashews by boiling about 3 cups of water in a tea kettle or small pot. Pour the boiling hot water over the cashews and let them soak for at least 20 minutes or overnight. Drain them when ready to blend. In a small pan, heat the olive oil and saute the onion, garlic and spinach for 2-3 minutes until the onion is slightly translucent and the spinach has wilted. Set aside. In a high powered blender such as a the Ninja, add the soaked, drained cashews, unsweetened almond milk, nutritional yeast, lemon juice, and salt. Blend until very smooth and creamy. Next, add the cooked onions, garlic, spinach and artichokes. Pulse a couple of times, but do not puree. You want to leave some of the chunkiness. Transfer to an oven safe dish or ramekins (I used 3 medium ramekins) and bake for 20 minutes or so until warm, bubbly and golden brown on top. Serve with pita chips, crackers or vegetable sticks. Looking for other creamy cashew recipes? Check these out!